Area 51 is a military base, and a remote detachment of Edwards Air Force Base. It is located in the southern portion of Nevada in the western United States, 83 miles (133 km) north-northwest of downtown Las Vegas. Situated at its center, on the southern shore of Groom Lake, is a large military airfield. The base’s primary purpose is to support development and testing of experimental aircraft and weapons systems. The base lies within the United States Air Force’s vast Nevada Test and Training Range (NTTR), formerly called the Nellis Air Force Range (NAFR). Although the facilities at the range are managed by the 99th Air Base Wing at Nellis Air Force Base, the Groom facility appears to be run as an adjunct of the Air Force Flight Test Center (AFFTC) at Edwards Air Force Base in the Mojave Desert, around 186 miles (300 km) southwest of Groom, and as such the base is known as Air Force Flight Test Center (Detachment 3). The intense secrecy surrounding the base, the very existence of which the U.S. government barely acknowledges, has made it the frequent subject of conspiracy theories and a central component to unidentified flying object (UFO) folklore. Groom Lake is not a conventional airbase, as frontline units are not normally deployed there. It instead appears to be used during the development, testing, and training phases for new aircraft. Once these aircraft have been approved by the United States Air Force or other agencies such as the CIA, operation of that aircraft is generally conducted from a normal air force base. Soviet spy satellites obtained photographs of the Groom Lake area during the height of the Cold War, and later civilian satellites produced detailed images of the base and its surroundings. These images support only modest conclusions about the base, depicting a nondescript base, long airstrip, hangars and the lake. Groom Lake was used for bombing and artillery practice during World War II, but was then abandoned until April 1955, when it was selected by Lockheed‘s Skunk Works team as the ideal location to test the forthcoming U-2 spy plane. The lakebed made an ideal strip from which they could operate the troublesome test aircraft, and the Emigrant Valley’s mountain ranges and the NTS perimeter protected the test site from prying eyes and outside interference. Lockheed constructed a makeshift base at the location, then known as Site II or “The Ranch“, consisting of little more than a few shelters, workshops and trailer homes in which to house its small team. In only three months a 5,000-foot (1,500 m) runway was constructed and was serviceable by July 1955. The Ranch received its first U-2 delivery on 24 July 1955 from Burbank on a C-124 Globemaster II cargo plane, accompanied by Lockheed technicians on a Douglas DC-3.The first U-2 lifted off from Groom on 4 August 1955. A U-2 fleet under the control of the CIA began overflights of Soviet territory by mid-1956. During this period, the NTS continued to perform a series of atmospheric nuclear explosions. U-2 operations throughout 1957 were frequently disrupted by the Plumbbob series of atomic tests, which detonated over two-dozen devices at the NTS. The Plumbbob-Hood explosion on 5 July scattered fallout across Groom and forced a temporary evacuation. 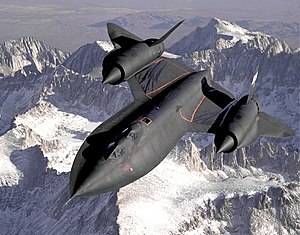 Even before U-2 development was complete, Lockheed began work on its successor as part of the CIA’s OXCART project, involving the A-12, a Mach-3 high-altitude reconnaissance aircraft – a later variant of which became the famed USAF SR-71 Blackbird. This aircraft flight characteristics and maintenance requirements forced a massive expansion of facilities and runways at Groom Lake in 1960 since the aircraft required an 8,000-foot (2,400 m) runway and additional infrastructure. The main runway was lengthened from 5,000 to 8,500 ft (1,500 to 2,600 m) in autumn 1960. Preparations began for the arrival of OXCART in early 1962: the FAA agreed to close off airspace around Groom Lake, security was greatly enhanced, and the small civilian mine in the Groom basin was closed. The facility received eight F-101s for training, two T-33s for proficiency flying, a C-130 for cargo transport, a U-3A for administrative purposes, a helicopter for search and rescue, and a Cessna-180 for liaison use, and Lockheed provided an F-104 chase plane. The first OXCART was covertly trucked to the base in February 1962, assembled, and it made its first flight 26 April 1962. At the time, the base boasted a complement of over 1,000 personnel. It had fueling tanks, a control tower, and a baseball diamond. Groom saw the first flight of most major Blackbird variants: A-12, the abortive YF-12 interceptor variant, and the D-21 Blackbird-based drone project. The A-12 would remain at Groom Lake until 1968 and occasionally deployed to other United States bases overseas. The SR-71 Blackbird, by contrast, first flew at Palmdale, California in December 1964, and Palmdale and Edwards AFB served as the primary operation sites for that model until Beale Air Force Base became active in early 1966. The Lockheed Have Blue prototype stealth fighter (a smaller proof-of-concept model of the F-117 Nighthawk) first flew at Groom in December 1977.Testing of a series of ultra-secret prototypes continued there until mid-1981, when testing transitioned to the initial production of F-117 stealth fighters. In addition to flight-testing, Groom performed radar profiling, F-117 weapons testing, and was the location for training of the first group of frontline USAF F-117 pilots. Subsequently, the still highly classified active-service F-117 operations moved to the nearby Tonopah Test Range Airport, and finally to Holloman Air Force Base. Area 51 border and warning sign stating that “photography is prohibited” and that “use of deadly force is authorized” under the terms of the 1950 McCarran Internal Security Act. A government vehicle is parked on the hilltop; from there, security agents observe the approach to Groom Lake. Since the F-117 became operational in 1983, operations at Groom Lake have continued. The base and its associated runway system were expanded. In 1995, the federal government expanded the exclusionary area around the base to include nearby mountains that had hitherto afforded the only decent overlook of the base, prohibiting access to 3,972 acres (16.07 km2) of land formerly administered by the Bureau of Land Management. The base has seven runways including one that now appears to be closed. The closed runway, 14R/32L, is also by far the longest with a total length of approximately 23,300 feet (7,100 m), not including stopway. The other runways are two asphalt runways, the 14L/32R with a length of 12,000 feet (3,700 m) and 12/30 with a length of 5,400 feet (1,600 m), and four runways located on the salt lake. These four runways are 09L/27R and 09R/27L, which are both approximately 11,450 feet (3,490 m), and 03L/21R and 03R/21L, which are both approximately 10,000 feet (3,000 m). The base also has a helipad. In December 2007, airline pilots noticed that the base had appeared in their aircraft navigation systems’ latest Jeppesen database revision with the ICAO airport identifier code of KXTA and listed as “Homey Airport“. The probably inadvertent release of the airport data led to advice by the Aircraft Owners and Pilots Association (AOPA) that student pilots should be explicitly warned about KXTA, not to consider it as a waypoint or destination for any flight even though it now appears in public navigation databases. The federal government explicitly concedes (in various court filings and government directives) that the USAF has an “operating location” near Groom Lake, but does not provide any further information. Unlike much of the Nellis range, the area surrounding the lake is permanently off-limits both to civilian and normal military air traffic. Radar stations protect the area, and unauthorized personnel are quickly expelled. Even military pilots training in the NAFR risk disciplinary action if they stray into the exclusionary “box” surrounding Groom’s airspace. Perimeter security is provided by uniformed private security guards working for EG&G’s security subcontractor Wackenhut, who patrol in desert camouflage Jeep Cherokees and Humvees, and more recently, champagne-colored Ford F-150 pickups and gray Chevrolet 2500 4X4 pickups. Although the guards are armed with M16s, no violent encounters with Area 51 observers have been reported; instead, the guards generally follow visitors near the perimeter and radio for the Lincoln County Sheriff. Deadly force is authorized if violators who attempt to breach the secured area fail to heed warnings to halt. Fines of around $600 seem to be the normal course of action, although some visitors and journalists report receiving follow-up visits from FBI agents. Some observers have been detained on public land for pointing camera equipment at the base. Surveillance is supplemented using buried motion sensors. The base does not appear on public U.S. government maps; the USGS topographic map for the area only shows the long-disused Groom Mine. A civil aviation chart published by the Nevada Department of Transportation shows a large restricted area, but defines it as part of the Nellis restricted airspace. The official aeronautical navigation charts for the area show Groom Lake but omit the airport facilitiesSimilarly the National Atlas page showing federal lands in Nevada does not distinguish between the Groom block and other parts of the Nellis range. Although officially declassified, the original film taken by U.S. Corona spy satellite in the 1960s has been altered prior to declassification; in answer to freedom of information queries, the government responds that these exposures (which map to Groom and the entire NAFR) appear to have been destroyed] Terra satellite images (which were publicly available) were removed from web servers (including Microsoft‘s “Terraserver”) in 2004, and from the monochrome 1 m resolution USGS data dump made publicly available. NASA Landsat 7 images are still available (these are used in the NASA World Wind). Higher resolution (and more recent) images from other satellite imagery providers (including Russian providers and the IKONOS) are commercially available. These show, in considerable detail, the runway marking, base facilities, aircraft, and vehicles. The President continues to annually issue a determination continuing the Groom exception.This, and similarly tacit wording used in other government communications, is the only formal recognition the U.S. Government has ever given that Groom Lake is more than simply another part of the Nellis complex. An unclassified memo on the safe handling of F-117 Nighthawk material was posted on an Air Force website in 2005. This discussed the same materials for which the complainants had requested information (information the government had claimed was classified). The memo was removed shortly after journalists became aware of it. There were specific instructions not to do this. was the only location which had such an instruction. Many of the hypotheses concern underground facilities at Groom or at Papoose Lake, 8.5 miles (13.7 km) south, and include claims of a transcontinental underground railroad system, a disappearing airstrip (nicknamed the “Cheshire Airstrip“, after Lewis Carroll’s Cheshire cat) which briefly appears when water is sprayed onto its camouflaged asphalt, and engineering based on alien technology. Publicly available satellite imagery, however, reveals clearly visible landing strips at Groom Dry Lake, but not at Papoose Lake. Several people have claimed knowledge of events supporting Area 51 conspiracy theories. These have included Bob Lazar, who claimed in 1989 that he had worked at Area 51’s S-4 (a facility at Papoose Lake), where he was contracted to work with alien spacecraft that the U.S. government had in its possession. Similarly, the 1996 documentary Dreamland directed by Bruce Burgess included an interview with a 71 year old mechanical engineer who claimed to be a former employee at Area 51 during the 1950s. His claims included that he had worked on a “flying disc simulator” which had been based on a disc originating from a crashed extraterrestrial craft and was used to train US Pilots. He also claimed to have worked with an extraterrestrial being named “J-Rod” and described as a “telepathic translator“. In 2004, Dan Burisch (pseudonym of Dan Crain) claimed to have worked on cloning alien viruses at Area 51, also alongside the alien named “J-Rod“. Burisch’s scholarly credentials are the subject of much debate, as he was apparently working as a Las Vegas parole officer in 1989 while also earning a PhD at SUNY. Novels, films, television programs, and other fictional portrayals of Area 51 describe it—or a fictional counterpart—as a haven for extraterrestrials, time travel, and sinister conspiracies, often linking it with the Roswell UFO incident. In the 1996 action film Independence Day, the United States military uses alien technology captured at Roswell to attack the invading alien fleet from Area 51. The “Hangar 51” government warehouse of the Indiana Jones films stores, among other exotic items, the Ark of the Covenant and an alien corpse from Roswell. The television series Seven Days takes place inside Area 51, with the base containing a covert NSA time travel operation using alien technology recovered from Roswell. Woomera Prohibited Area, a defense and aerospace testing area in Australia.